Stop motion animation special effects: Willis O'Brien. 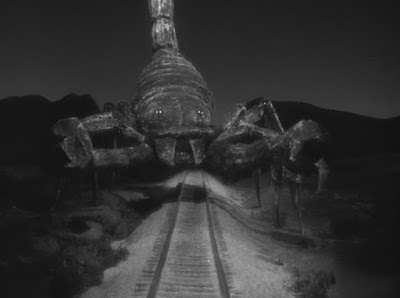 The Black Scorpion is the kind of film that tends to grow on you the more you watch it. This low budget film delivers with whatever resources it has as its disposal. The end result is an enjoyable and entertaining 88 minutes of escapism. The film opens with stock footage showing the explosive forces of volcanoes and scenes of destruction that nature has visited upon human life and property. The volcano shown was Paricutin which erupted in 1943 and was active for about a decade. Having established the savage mastery of Nature, an alternating series of black on white and white on black title and credits are then shown. 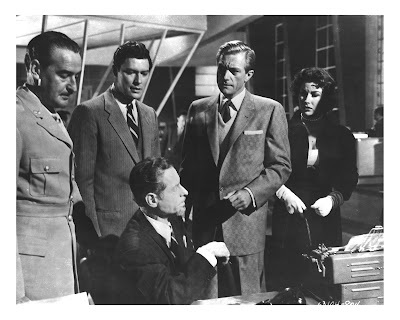 12 miles from the village of San Lorenzo a Jeep is being driven over volcanic terrain by an American Geologist, Dr. Hank Scott (played by our by now familiar and dependable stalwart actor, Richard denning) accompanied by Dr. Arturo Ramos, a Mexican Geologist. They soon encounter a couple of telephone linesmen working to repair the damaged telephone service. After asking for directions to San Lorenzo and enquiring if anyone has made it through, they are informed that a police car went through earlier but has not as yet returned. A feeling of impending trouble is set up in the mind of the audience. Close by to a farm house, a mysterious sound causes Arturo and Hank to stop driving. The Jeep’s radiator needs water, so they approach the farm house calling out to find out if anyone is there. They soon discover to their utter surprise a damaged and abandoned police car. Hank asks, “what could do this to a car out here?” We can only imagine that the something would be big, powerful and dangerous. 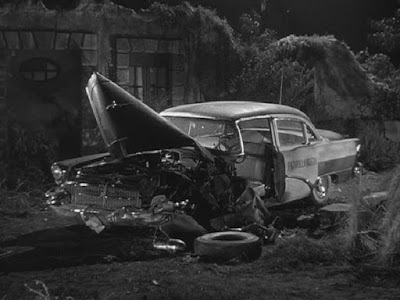 Arturo calls in the “accident” on the damaged patrol car 511’s radio and reports that “no one is here.” But why? They suddenly hear a rattling sound which immediately sets us up to expect a rattlesnake. As the two men search for the source of the sound in the house, they come across a pot of beans still boiling on the stove. So whatever did happen, probably happened quickly and not that long ago! Just as we have had one set of expectations set up for us, the two men come across a baby who is still alive. As we breathe a collective sigh of relief, Hank carries the baby back to the Jeep. The tension is not long relieved when a sound draws Hank and Arturo toward a bush that conceals the body of the dead sergeant Vegas. What is especially shocking about the gruesome find is the look of sheer terror on the dead policeman’s face and that an inspection of his gun shows that “every cartridge has been fired.” Something so horrible has managed to leave an indelible post-mortem imprint of terror on a grown man’s face. That something had also caused the policeman to empty his gun at it without having been able to kill it. What exactly are we up against here? When Hank and Arturo arrive in San Lorenzo they are greeted by a cacophonous din emanating from a panicked crowd of terrified peasants. Hank calls out amidst the uproar, “We're from Mexico City! I say, we're from Mexico City! We're scientists! Is the mayor here?” His bellowed query is at last answered by the presence not of civil authority but more importantly in the eyes of the rural Mexicans, by religious and spiritual authority in the form of the local Priest, Father Delgado. Later during a meal, Father Delgado explains that the deaths began the first Sunday after the eruption of the volcano. In accordance with his science-based view of the world, Arturo declares that there must be some “simple logical cause.” Delgado goes on to explain about the superstition of the huge "demon bull" by saying that it is a “symbol of evil among many ancient civilizations." The men from the Mira Flores Ranch brought the demon bull story with them having abandoned the place two days ago. The next morning. 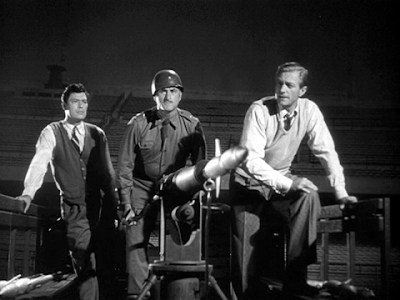 Major Cosio asks Hank and Arturo not to embark on their “unnecessary expedition.” Regardless, they set off on their mission to the volcano, informing Cosio that they intend to return to San Lorenzo that evening. 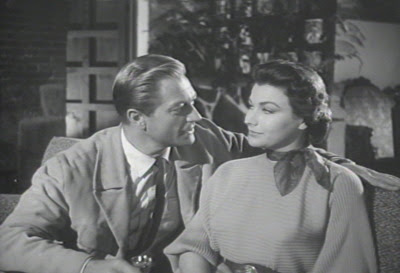 Hank and Arturo drive off to find her and discover that she is unharmed and that she is Teresa Alvarez (played by beautiful actress, Mara Corday), owner of the Mira Flores Ranch. As Arturo goes to retrieve her saddle, he notices a piece of obsidian which he picks up and takes back to the waiting Hank and Teresa. We know that this cooled piece of lava is probably important and will feature later in the story. The two geologists are now to make Mira Flores their base camp. Back in San Lorenzo Hank and Arturo are summoned to see the Major and Dr. de la Cruz. De la Cruz’s findings suggest that the dead policemen’s subcutaneous cells have “run rampant” and that an “organic poison” is involved. There is the presence of a wound but no blood. There is also the presence of bacteria. Even more intriguing is the evidence of strange footprints of which casts have been made. Further investigations will need to be made using more sophisticated equipment. Dr.De la Cruz: I hope I can answer it. Hank Scott: Well, the alcohol, the distilled water, the salt solution - I can understand that, but what's the tequila for? Dr.De la Cruz: Well, in your country I believe they call it a coffee break! All: Ha! Ha! Ha! Ha! Oh, Puncho! Oh, Cisko! We are so funny! With the sullen volcano brooding ominously in the background, Arturo, Hank and Teresa drive to Mira Flores. At the ranch, one of the ranch hands comments that the “cattle knows there’s something evil in the wind.” After being introduced to the young Juanito and a bit of romantic verbal ping pong between Hank and Teresa, our attention is drawn back to the strange obsidian rock Arturo picked up earlier. Inside the obsidian is a trapped scorpion. 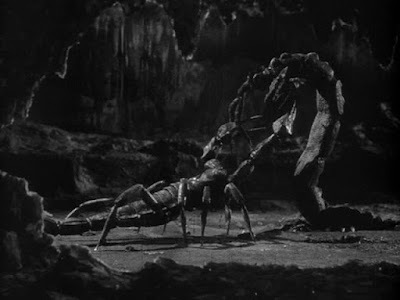 When Arturo breaks it open, a micro-cosmic foreshadowing of later events emerges in the form of a live scorpion. But how could this be? In a remarkable piece of irony, Hank places the scorpion in a jar while Arturo goes off to fetch a magnifying glass “to watch this little monster.” If only they knew! As if on cue, the next event is heralded by the ringing of the telephone. The lineman has rung to inform Teresa that her phone line was the last to be fixed and he is testing the line. 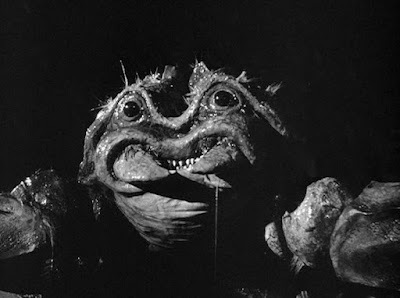 Suddenly his fellow linesman on the ground is confronted by a huge scorpion possessing an almost human-like face with a countenance full of evil intent dribbling a saliva-like substance from its mouth. The effect is enhanced by the camera zooming in for a close-up shot. One can imagine special effects genius, Ray Harryhausen nodding his head in approval as one of Willis O'Brien’s creations snatches up the man and carries him off under a bridge. 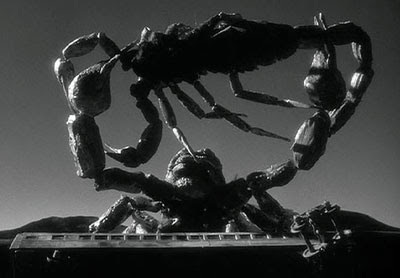 See the fluid motion of the creature together with the clever camera work as it tracks the scorpion effortlessly flipping the truck over and killing the linesman. The giant scorpion then chases the other lineman back up the pole, plucks him off, and kills him. Panic soon ensues with yet another volcanic eruption as the scorpion launches an attack on Mira Flores. Peasants and cattle stampede. We have a shot of one woman falling and almost being trampled to death until one man stops to pick her up and rescues her from certain death. Therein lies that one hope for humanity: a single act of selflessness and kindness - commodities that are all too often in short supply. Dr. Velazco proposes the use of poison gas as a weapon to combat this newly discovered species: Scorpionida Rex. At this point of deciding who’s going to do what, the then natural inclination would have been to shield the female from all possible danger and let the guys go off and do manly stuff. Well, Ms Alvarez will have none of it. In fact, Dr. Velazco admits to her, “I think you have found yourself a job.” Still, she did feel as though she had to ask their permission! I guess you don’t get anywhere in life unless you persist and keep asking and insisting. 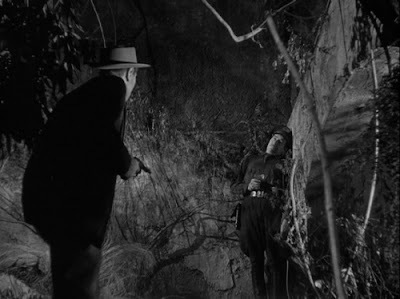 A search for the scorpions’ lair is conducted involving ranch hands and the army when suddenly one of the horsemen, Mendoza, falls into a crevasse at the site of the volcano. The depth of the crevasse can be gauged by the fact that when a stone is cast down into it, no sound of impact can be heard. Hank and Arturo decide to descend into the dark doom-laden depths of the demon’s abode. Before doing so, they discover that intrepid Juanito has stowed away on the trailer. Equipped with climbing paraphernalia and protective clothing, the two geologists enter a metal cage and are slowly lowered down into the abyss. Midway down they are greeted by a large and rather irate scorpion lurking on a ledge. After Hank takes its picture they continue their descent. These days he would have taken a selfie with the scorpion and tried to collect as many Pokémons as he could on the way down! 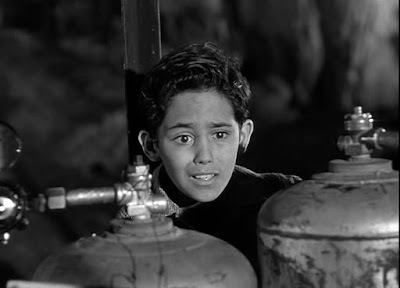 At the end of their descent, they find themselves in a “huge cavern.” Hank and Arturo are at this point unaware that the pesky kid, Juanito has secreted himself behind the gas bottles in the cage. A perfect recipe for up-coming trouble! The two geologists photograph a huge inchworm that they estimate is at least “30 feet long” and then stumble across the remains of the clumsy and unfortunate Mendoza who had earlier fallen in. As our erstwhile little trooper, Juanito ventures forth to explore on his own, a battle royal erupts between the giant inchworm and some large scorpions. Eventually the largest scorpion which is “the granddaddy of them all” emerges victorious to claim the Andre the Giant trophy. Meanwhile, our little gnat, Juanito decides to tug at a trap door and is then chased by a thoroughly incensed giant spider for his troubles. Fortunately for him, Hank and Arturo are able to kill it by blasting it with their rifles. In his defence, Juanito tells the two men, “I came to help you.” Before they can say to him, “We’ll give you I came to help you,” the three are overcome by an urgent need to dash back to the cage with alacrity. Unfortunately, they find that the scorpion has arrived there first and is expressing its dislike of the aesthetic qualities of the recent addition to its cavern’s decor. With the cage now detached from the line, Arturo in a tension-filled long moment hangs on to the line as it is being pulled up. He eventually makes it safely back to the surface. The process is repeated for Hank and Juanito but this time with the aid of a loop on the cable. After they are pulled to the surface, Velazco orders the opening to be sealed with explosives. Later on, Velazco in Mexico City calls Hank in San Lorenzo and orders him and Arturo to Mexico City to complete their report. It is believed that it would be better if Hank “assumes that the danger is completely over.” Why it is thought that subterfuge is needed to be resorted to I’m not sure. Hank and Arturo are professionals and could have had the urgency of the real situation explained to them. After Hank and Arturo, together with Teresa arrive in Mexico City, they are taken to the University to meet with Dr. Velazco. Recent aerial photographs of the San Lorenzo area showed the presence of a giant scorpion. Together with the possible survival of giant scorpions, there is also an underground system of caves and caverns that could be made use of by the scorpions. One branch of the cave system sits uncomfortably close to Mexico City, a city of 4 million people. In time-honoured sci-fi film (and all too often real-world) fashion, it is felt that secrecy is needed to be maintained as the resulting panic could prove to be worse than the scorpions. While Hank and Teresa have a drink at a night club and plan dinner, Teresa declares that they “won’t have a worry in the world.” The irony of this remark comes crashing down when in the next scene a train from Monterrey to Mexico City is attacked by the scorpions and is derailed. 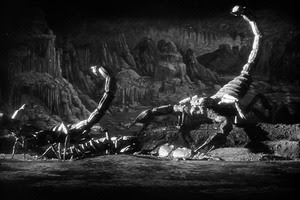 The largest scorpion, the Black Scorpion, has arrived at the train wreck site and kills some of the other smaller ones. Meanwhile Mexico City is ordered evacuated. Enter the might of the 1950s Mexican military! Yes, we saw their air force of about three P51s take on Kronos in the movie of the same name and…. Oh, yes…never mind! A plan is hatched is to lure the scorpion into an arena using steer carcass meat, then shoot it with a projectile that will be used to electrocute the creature with 600,000 volts. 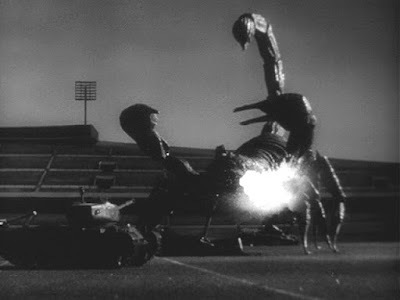 When the scorpion arrives at the stadium, a pretty impressive battle takes place with the military utilising tanks and helicopters to attack the creature. The first shot of the projectile misses. An unintentionally funny moment occurs when a soldier is retrieving the projectile and declares, “I won’t miss this time” only to be accidentally electrocuted himself! Ouch! The second shot, however, is successful and the electricity is applied. The scorpion finally lies dead on the ground of the stadium and we end with a long shot of the dead scorpion. Willis O'Brien was the creator of the stop-motion effects for the original King Kong. Back in 1933, as a young boy, Ray Harryhausen would have gone to see the film King Kong with his parents and would have marvelled and been inspired by the magic spun on the screen by Willis O’Brien. 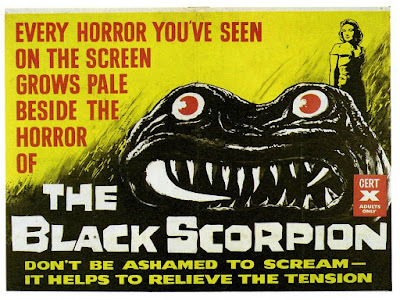 The Black Scorpion was the final film for which Willis H. O'Brien designed special effects. There are about 1500 - 2000 known species of scorpions world-wide. They are most often thought to be desert creatures, but scorpions can also be found in quite cool and wet regions such as in the forests of Brazil, in British Columbia, in North Carolina, and even the Himalayas. Belong to the arachnid group which are invertebrates with four pairs of legs and two body parts. Are part of a group of creatures that includes spiders, ticks and mites. Possess a large pair of pincers and a tail with a venomous sting on the tip. Have been around for some 450 million years. Are largely nocturnal in their activity. Mate by performing a mating dance during which the male deposits a packet of sperm on the ground before guiding the female over it to be picked up. Give birth to live young that spend their early life on the back of the mother. Spend most of their lives resting under rocks, pieces of wood, or in burrows. Can slow their metabolism, use little oxygen and live on as little as a single insect per year! Require soil to thrive being burrowing creatures. Are resilient: Specimens have even been frozen overnight, placed in the sun the next day to thaw out and then have simply scuttled off unscathed! People fear scorpions because of the sting on their tail and their venom. 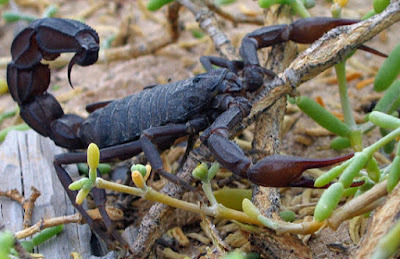 Several thousand people do die each year from scorpion stings, mostly from species in northern Africa, the Middle East, India, Mexico and some parts of South America. Only 30 or 40 out of the 1500 – 2000 species of scorpion have venom strong enough to kill a person. There are no giant scorpions. ……as far as we know!